BTS has made history by becoming the first K-pop group to present at the Grammy Awards. The group, which was also nominated for an award, presented the Best R&B album to new Grammy winner H.E.R. The seven band members said that they had always dreamed about “being on the Grammy stage” adding that they would “be back”. They also paid homage to their country, wearing tuxedos designed by South Korean designers. 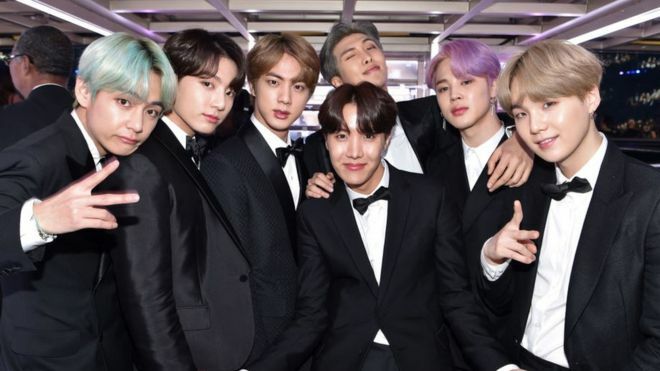 According to Vogue, JayBaek Couture designed custom suits for Jungkook, Jin, Jimin, Suga, V and RM, while J-Hope’s suit was designed by Kim Seo Ryong – something that did not go unnoticed. The boys also rolled up to the event in a Hyundai – a South Korean car manufacturer. The hashtag #TearItUpBTS also began trending when the boy band arrived at the awards show. They also started trending in South Korea and were one of the top 20 searches on Naver, one of South Korea’s largest search engines. Their fellow celebrities at the Grammys also gave them a shout out. Anna Kendrick, who was sat next to the band, jokingly said that she would provide them with “a snack or whatever”. BTS’ 2018 album “Love Yourself: Tear” was nominated in the category of best recording package but did not win. The hugely popular K-pop group – one of few that have managed to break into the West- are considered one of the most successful acts of the South Korean music industry.